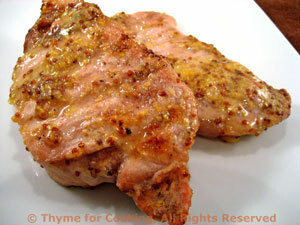 Thyme for Cooking Barbecue: Grilled Pork Chops with Sweet Mustard. Lots of hot mustard is tempered by the sweetness of the marmalade. In small bowl stir together marmalade, mustards, garlic and oil. Spoon over chops and set aside while the grill heats. Remove from marinade and cook on barbecue 10 - 15 minutes turning once or under broiler for 12 - 15 minutes turning once - or sauté in large skillet 10 - 15 minutes (you get the picture). In all cases it depends on thickness and test for doneness by slicing and peaking.